“The study, led by Prof GE Séralini, showed that very low doses of Monsanto’s Roundup herbicide had toxic effects on rats over a long-term period, including serious liver and kidney damage. Additional observations of increased tumour rates in treated rats would need to be confirmed in a larger-scale carcinogenicity study”. Sachs refers to Bruce Chassy, a scientist who runs the pro-GMO Academics Review website (and has ‘form’). Chassy was the first signatory of a petition demanding the retraction of the Séralini study and the co-author of a Forbes article accusing Séralini of fraud. 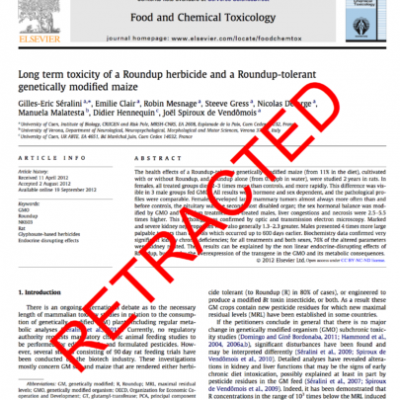 In neither document does Chassy declare any link with Monsanto. But in 2016 he was reported to have taken over $57,000 over less than two years from Monsanto to travel, write and speak about GMOs. Featured image is from Chemical Concern.